Do you think you know what a cornfield looks like? You don’t know what a cornfield looks like. 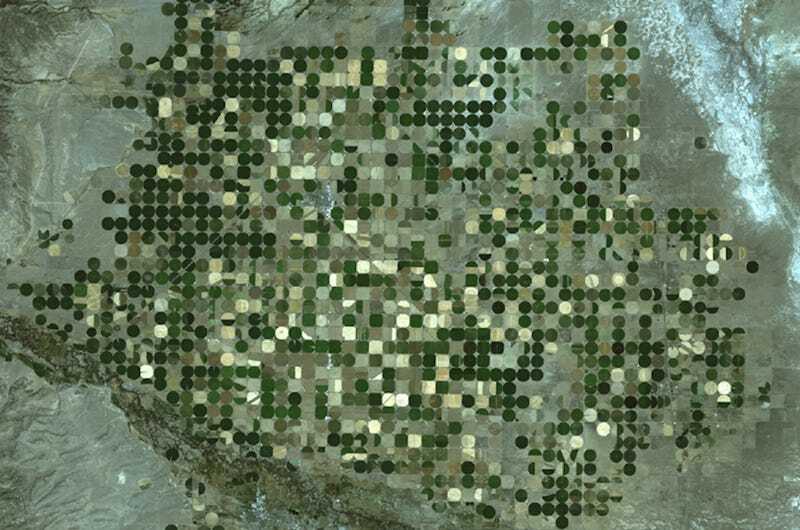 NASA released a series of pictures showing the rather odd-transformation of this large tract of Kansan farms, changing their shape from rectangles to circles between 1972 and 2015 (with stopovers in 1988 and 2011). What’s going on here? 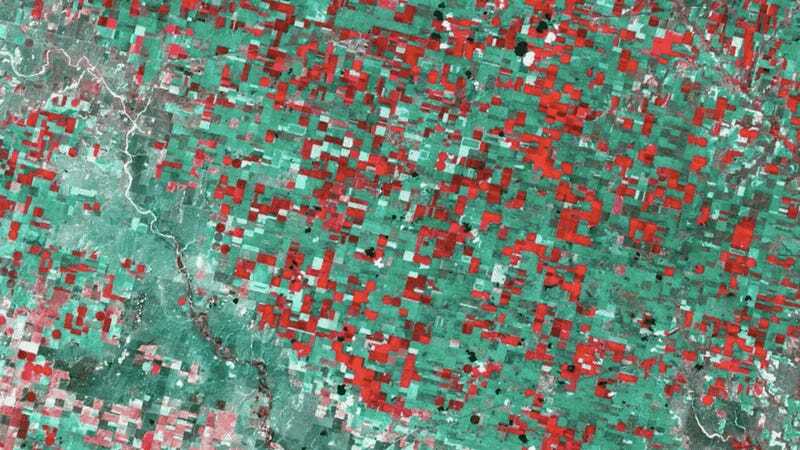 Have Kansas’ farmers been breaking out the protractors to engage in a four-decade long troll of satellite imaging operators? Not at all. This is actually the same thing that’s been happening all over the country as America’s farms very quietly, and with almost no fanfare, completely changed their shape, from neatly-gridded little rectangles to a series of tidy circles. The transformation has nothing to do with appearance, and everything to do with a change in how we water our farms and the tool we now mostly use to do it: a center pivot irrigation system. A center pivot irrigation system is exactly what it sounds like: An automated sprinkler system that pivots around a central point, giving the field a circular shape. Why did this particular irrigation system start to take off about forty years ago, though, and then take over? The center pivot irrigation system is actually pretty old. It’s been around since the 40s. Farmers didn’t start really using them on a large-scale, though, until decades later–and for good reason. The earliest models were giant steel contraptions made of a series of raised sprinklers, supported on towers. They were insanely heavy, easily broken, ridiculously complex to repair, and not very good at sprinkling water evenly. By the late 60s, however, manufacturers had figured out how to make them lighter, simpler, and more standardized. and over the next decade farmers rapidly began adopting them. By tapping the systems directly into groundwater, farmers were suddenly able to almost completely and easily automate irrigation from deep wells. Today, there are over 34 million acres of crops in the U.S. irrigated by some kind of sprinkler system—and just under 28 million of those are irrigated by a center pivot irrigation system. That’s over half of the total 55 million American acres that are irrigated at all. Wait, how have I not noticed this? If you’re watching from high up, it’s not hard to see that the shape of the fields has completely changed. But if you’re on the ground, seeing those circular shapes you see in the satellite photos is much harder. First, because the circular fields are stretched to the very limits of the square plots of land that they usually still occupy—making the curvature too big for your eye to take in all at once. But it’s also a trick of the eye. Inside of those circles, the straight lines of the farm, and the grids that the plants are laid out on appear, essentially, the same as they ever were—and that’s because they mostly are. It’s just the way we water those farms that has changed.